The increasingly less pervasive notion that classical music is somehow incompatible with the present-day is, at best, downright lazy thinking. Helping quell the ideological gap between the past and present, Berlin imprint Neue Meister in association with DRIVE are at the forefront in exposing a rich tapestry of the most exciting and progressively-minded contemporary classical artists the world over. Tonight, the fourth outing of the ground-breaking concert series, Lifelines is an exhibition not merely in synthesis and collaboration but also the regeneration fundamental to the genre’s staying power. Hosted in the spacious and ultra-modern DRIVE: Volkswagen Group Forum in Mitte, tonight’s setting runs parallel with the cutting-edge nature of the showcase in itself. 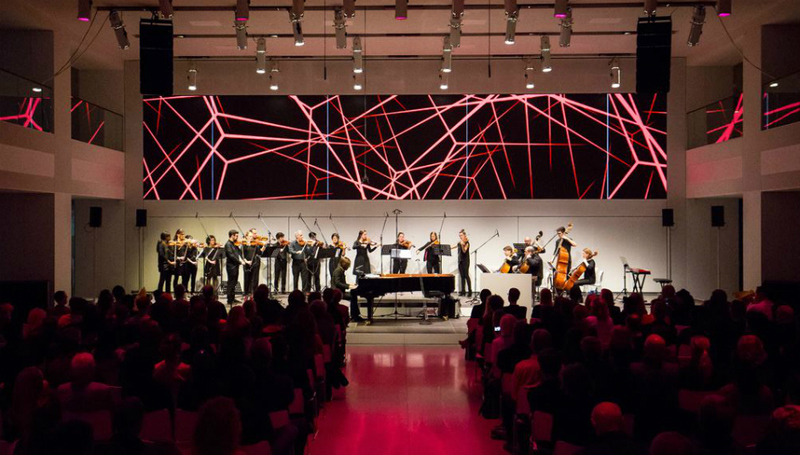 Rather than perhaps predictably opt for a more traditional arena, tonight’s event – in which five diverse composers perform work adapted with the Berlin Chamber Orchestra – takes advantage of the symbolic nature of pitching up in what is essentially a super-slick showroom, as well as benefiting from the natural architectural acoustics of the gleaming 4,500 m² building. Comprising a few familiar faces from Germany’s classical and electronic scenes, tonight’s mostly-seated audience are first met with the appearance of Gregor Schwellenbach. A well-travelled German musician and performer of up to twelve different instruments, his three-part piece for orchestra proves a subtle opening gambit that sees restraint and melodic finesse blend in keen fashion. Performing the first and third acts on piano, Schwellenbach also conducts on the second and most emphatic movement, in which the concise interplay between the twenty-piece Berlin Chamber Orchestra delivers his vision with understated aplomb. A relaxed yet compelling start from an artist who doesn’t needlessly overemphasize his broad sonic scope. After a brief changeover, Australian composer, violist, conductor and adopted Berliner Brett Dean takes to the stage. A fluent German speaker, Dean – who is best known to many in attendance as violist in the Berlin Philharmonic Orchestra from 1985 to 1999 – introduces his work for flute and string orchestra, The Siduri Dances. Stemming from Dean’s earlier work for solo flute, Demons, tonight we are treated to a brief yet brilliant rendition, largely thanks to Australian flautist Lina Andonovska who drives the performance with wonderfully extroverted command throughout. Weaving moments of real majesty from the piece’s gravity-defying melodic twist and turns, her display veers from rapturous and boundlessly expressive to a strong sense of placid culmination. Indeed, bolstered with remarkable accuracy by the Berlin Chamber Orchestra via Dean as conductor, Andonovska’s wunderkind display is a real highlight this evening. From one virtuoso to another, Bosnian-born Swiss accordion player Mario Batkovic has long confirmed his reputation as a master of his chosen instrument, a fact evinced by his progressive, minimal-yet-immersive style. Originally written for string ensemble, Batkovic – who is signed to Geoff Barrow's Invada Records label – performs a full-orchestra version of Ineunte Finis, a piece that evokes both Philip Glass’ more fateful symphonic releases and Clint Mansell's main theme from Darren Aronofsky's Requiem For A Dream. But in typical Batkovic form, the comparisons end there: from his use of extended technique via pitch bends and playing rhythmic patterns on the keys without moving the bellows, to tonally approaching his instrument almost as if performing on synthesizer, Batkovic – typified with this stirring piece – effortlessly asserts his unique place in bridging the space between classical and contemporary experimental trends. Offering some stripped-back respite shortly afterwards, forthcoming special guest in his own right, Toronto composer and pianist John Kameel Farah is accompanied by Munich violinist Gabriel Adorjan to perform a selection of preludes by Russian-born American composer and pianist Lera Auerbach. With Auerbach currently busy with a jam-packed schedule Stateside, Farah and Adorjan prove a perfect match in filtering her work in delicate and deeply evocative fashion. With the panorama of a full moon and the deep chasm of space looming bright just over their shoulders, their performance – which is especially notable for their joint instinct for rhythm beyond the reliability of the full orchestra this evening – imparts an air of Arvo Pärtian purity and almost sacred poise across its three pieces. One of the more far-reaching propositions on the bill this evening comes in the form of Tamar Halperin Trio, who perform new sound spaces from their ambitious project, bachSpace, for the first time with orchestra. Comprising Israeli harpsichordist, pianist and musicologist Halperin, violinist Etienne Abelin and composer Tomek Kolczynsky, they perform a varied series re-arranged for orchestra, including pieces by Kolczynsky and Bach’s Prelude in C Major. Incorporating a host of electronic textures and restrained beats courtesy of Kolczynsky, the interaction between Halperin and Abelin proves particularly fascinating throughout. Where a longer set would surely have revealed the scope of their collaborative powers, the trio’s slot makes for a sweeping and occasionally inspired insight into how, given the right variables and cohesion, classical and electronic music can be naturally harmonious, in honour of the greats and far beyond. Five performances down, John Kameel Farah returns to the stage, accompanied this time by the orchestra. Despite a little technical glitch with his microphone signal, Farah’s introduction to his performance of ‘Behold!’ from his forthcoming album Time Sketches is both enlightening and good-humoured in equal measure. Preceded by a tale of the Hanover concert hall belonging to a home for blind children that he rented for the recording, the context enhances the visual impact of the piece, not least in its polyrhythmic patterns, snaking melodies and spiralling upwards scales. Indeed, with each piece of Time Sketches set to come with one of Farah's own illustrations in the booklet, the composer and pianist’s holistic creative vision for the release is fortified and edged into hypnotic territory this evening courtesy of its conversion to incorporate both orchestra and synthesizer, performed tonight by Gabriel Adorjan. A mesmeric, all-too fleeting highlight this evening from what is certain to be an essential release from the Berlin-based musician. Sealing the deal on a showcase assembling musical minds from all corners and dispositions, Swiss composer, saxophonist and jazz-classical wonder Daniel Schnyder presents a fitting swansong. A musician particularly preoccupied with forging threads of unity between both popular and classical realms, he focuses his efforts tonight on his “rock variations”, namely zealous re-imaginings of Jimi Hendrix’s ‘Purple Haze’ and the Rolling Stones’ ‘Sympathy For The Devil’. A performance that sees the full – and in parts truly exquisite – range of the orchestra put to use, the stellar lulls and rises of Schnyder’s palette-spanning playing is a real case in point for the increased cross-pollination of jazz with classical with rock and vice versa. And once more tonight, it’s homage – as well as the sheer freedom to re-configure one’s own work for orchestra – that proves catalytic in seeing at least two disparate fields meld wonderfully. With ever-developing technological innovation fuelling contemporary classical music’s limitless and exciting trajectory at the minute, tonight makes for a hugely enjoyable reminder just how the aforementioned “lazy thinking” regarding the compatibility of classical music with the present-day will soon simply be a misconception relegated to history.